The Orb-1 Cygnus cargo ship built by Orbital Sciences Corp. of Dulles, Va., is seen at the end of a robotic arm with a dazzling view of Earth as the backdrop in this view from the International Space Station on Jan. 12, 2014. The commercial cargo ship delivered 2,780 pounds of supplies to the station. A privately launched cargo ship packed with late Christmas presents and space-traveling ants linked up with the International Space Station on Sunday (Jan. 12) in a milestone delivery mission for the astronauts onboard. Space station astronauts used a robotic arm to capture the unmanned Cygnus spacecraft early Sunday morning and attach it an open docking port as both spacecraft sailed 260 miles (418 kilometers) above Earth. The special delivery comes courtesy of the Dulles, Va.-company Orbital Sciences Corporation, which launched the Cygnus spacecraft on Thursday (Jan. 9) to make its first commercial resupply mission to the station for NASA. Orbital Sciences' Cygnus commercial cargo ship is on its final approach to the International Space Station before being captured by a robotic arm on Jan. 12, 2014. The spacecraft is carrying 2,780 pounds of supplies to the station. "The cargo is comprised of vital science experiments, crew provisions, spare parts and other hardware," NASA officials said in a statement. "One newly arrived investigation will study the decreased effectiveness of antibiotics during spaceflight. Another will examine how different fuel samples burn in microgravity, which could inform future design for spacecraft materials." The mission was originally slated for a mid-December launch, but Orbital Sciences officials and NASA delayed the flight to January when a cooling system malfunction on the station forced astronauts to perform emergency spacewalk repairs. Bitter cold temperatures and a surprise solar flare added extra delays last week, with the Cygnus spacecraft finally launching on Thursday from the Mid-Atlantic Regional Spaceport's Pad-0A at NASA's Wallops Flight Facility on Wallops Island, Va. It lifted off atop an Orbital-built Antares rocket. 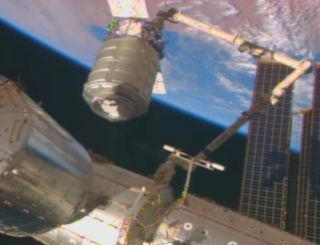 Despite the delay, Sunday's arrival appeared to go flawlessly, with astronauts Mike Hopkins of NASA and Koichi Wakata of Japan — both flight engineers with the station's six-man Expedition 38 crew —easily latching onto the Cygnus spacecraft with the station's robotic arm. "Our first mission under the [Commercial Resupply Services] contract with NASA was flawlessly executed by our Antares and Cygnus operations team, from the picture-perfect launch from NASA's Wallops Flight Facility to the rendezvous, capture and berthing at the space station this morning," Orbital President and CEO David Thompson said in a statement. Orbital Sciences' robotic Cygnus commercial cargo ship is seen perched at the end of the International Space Station's robotic arm as sunrise approaches on Jan. 12, 2014, docking day for the spacecraft. Orbital's $1.9 billion cargo delivery deal with NASA calls for the company to launch at least eight resupply missions to the space station by 2016 to ferry a total of 40,000 lbs. (18,143 kg) of supplies to the orbital lab. The company's Cygnus spacecraft are bus-size disposable spacecraft designed to deliver supplies to the station, and then haul away trash and unneeded items for disposable. A Cygnus spacecraft visited the station last September in a debut test flight, but that demonstration mission did not carry a full cargo load. The Cygnus currently at the station, known as Orb-1, is due to depart the orbiting lab on Feb. 18 and be intentionally destroyed on Feb. 19, when it is scheduled to burn up in Earth's atmosphere. Orbital officials named the Orb-1 Cygnus the Spaceship C. Gordon Fullerton in honor of the late NASA astronaut Gordon Fullerton of the same name, who died last year. "Very pleased the S.S. C. Gordon Fullerton performed so well. Just as its namesake would have expected," Orbital officials wrote in a Twitter statement Sunday. "'Gordo' would be proud!" NASA currently has contracts with Orbital and the Hawthorne, Calif.-based SpaceX for commercial resupply missions to the station using unmanned spacecraft. SpaceX has a $1.6 billion deal with NASA for 12 cargo missions using its Falcon 9 rockets and Dragon space capsules. Two of those missions have flown so far, with the third slated to launch on Feb. 22. "This resupply operation is the life of the space station," NASA astronaut Cady Coleman said during docking commentary on Sunday. "It is one thing to get the crew up there, but it is really important to get the supplies up there."